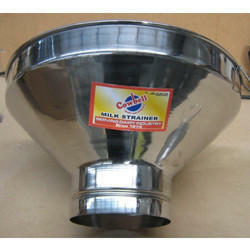 Our product range includes a wide range of stainless steel milk strainer and aluminum milk strainer with sieve and lock. Cowbell Milk Strainer Stainless Steel is best suitable device to filter Milk, the milk Strainer can be placedon milk can and can used to filter milk. Elegant , Easy to clean , Smooth Finishing, Mirror Finish Polishing.These Milk Strainers are widely used in Milk Dairy Industry, Dairy Farms and many Food Processinguses. 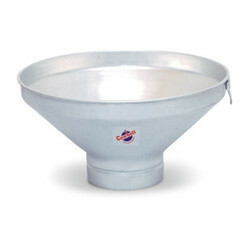 The Milk Strainer is supplied with Stainless Steel screen and Stainless Steel Lock. Cowbell Milk Strainer Aluminum is best suitable device to filter Milk, the milk Strainer can be placed onmilk can and can used to filter milk. Elegant, Easy to clean , Smooth Finishing, These Milk Strainers arewidely used in Milk Dairy Industry, Dairy Farms and many Food Processing uses. The Milk Strainer issupplied with Stainless Steel screen and G.I. Lock.